Four of us buddies Benny, Semi, Ricky and me went on a free and easy Batu Pahat food trail. Armed with suggestions from Johor Kaki readers, we had no detailed or specific plan. 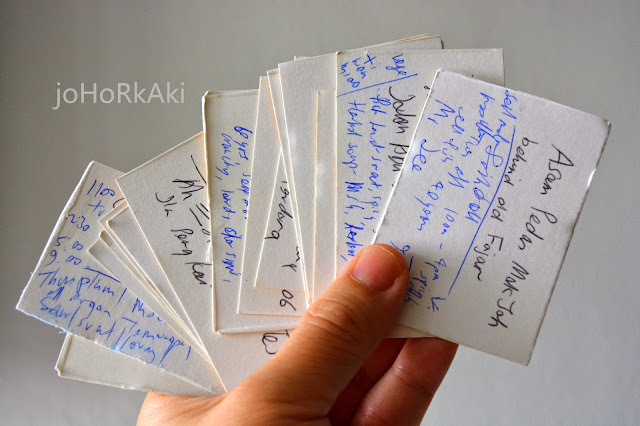 We went with some general idea about where were the well known eateries, and a willingness to be lost and try out anything interesting that we might stumble upon. The well known eateries were really the fall backs, in case we were lost and very hungry. Our main targets were readers' suggestions and stumble upons. OK, let's get on with the trip. After exiting the Ayer Hitam toll along the North South Expressway, we headed in the direction of Batu Pahat via little Ayer Hitam town. 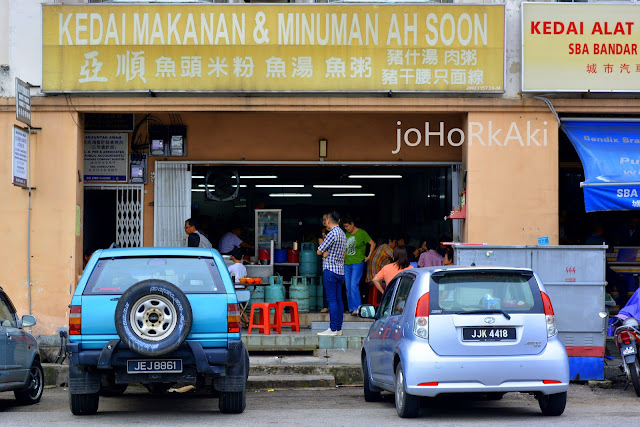 Just 5 minutes from the Ayer Hitam toll, we stopped at Tang Chuan 东泉 dim sum shop for a quick carbo and caffeine top up before heading to Batu Pahat, which is about 45 minutes away. The kopitiam style dim sum at Tong Chuan are hand made here at the old shop. We all like the bao's 大包 thick, fluffy snowy white skin. 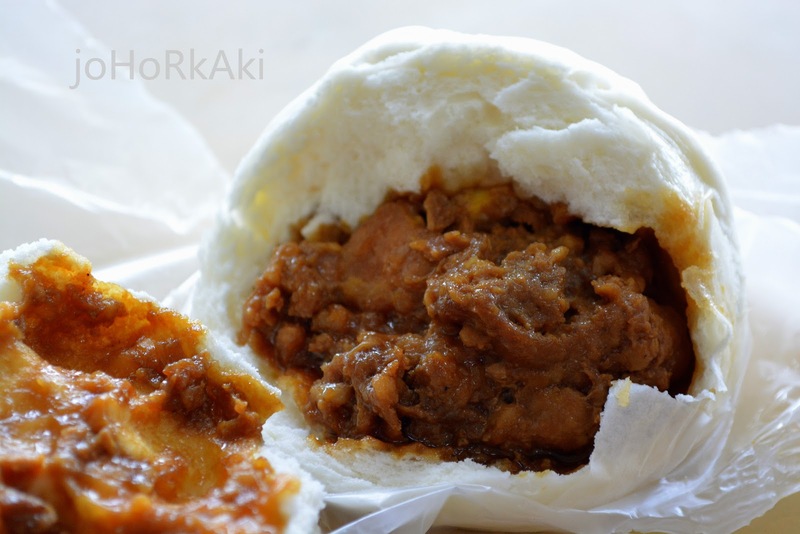 Though we all like the savoury-sweet flavour of the pork filling, we felt it was too soft and minced too finely. I prefer my pork filling chunky, chopped or sliced. 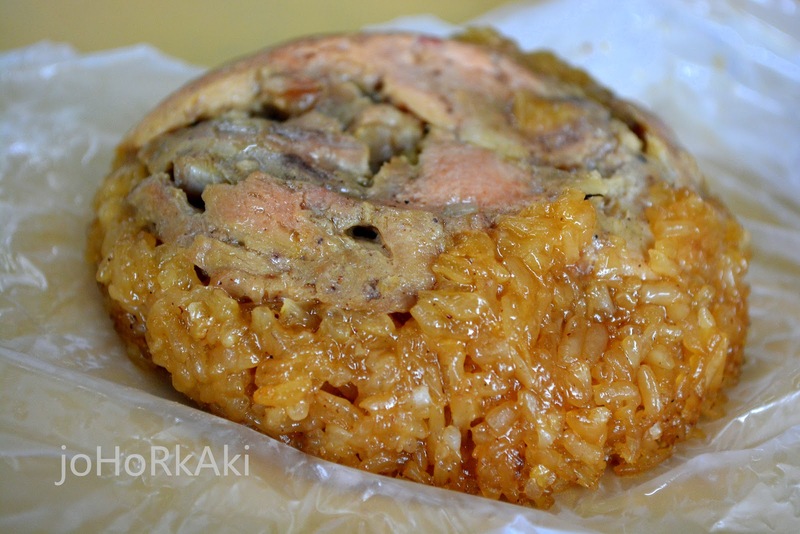 The Lo Mai Kai 糯米鸡 was well balanced between sweet and savoury, the chicken was tender, but the gummy glutinous rice was quite stiff and chewy. 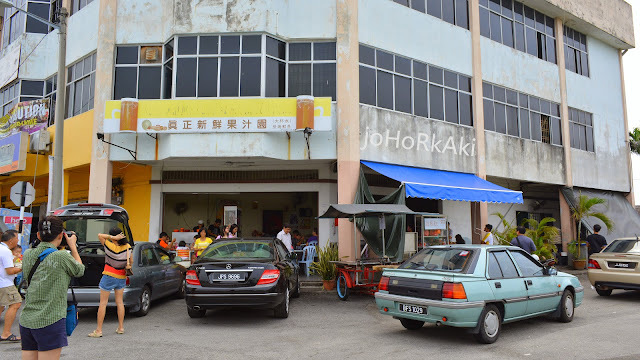 Our first stop in Batu Pahat was the legendary Ah See Kee wantan noodles 亞泗雲吞面. 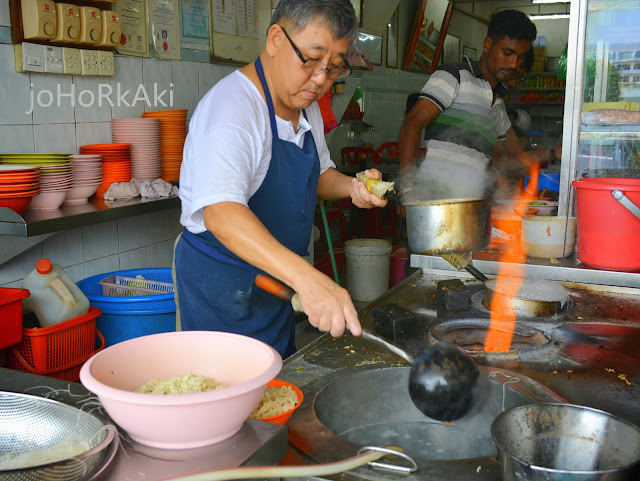 Ah See has been selling his unique style of wantan mee for 60 years and almost everyone here in Batu Pahat knows this famous shop. 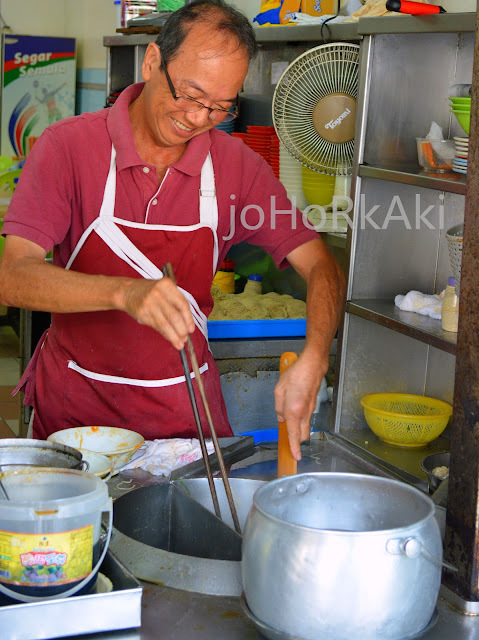 Ah See and his family make everything at the shop from the egg noodles to the wantans, char siew and signature sauce. I love Ah See's crunchy, springy noodles and also his unique savoury, aromatic blend of lard, sesame oil, chili and soy sauce. My companions, however, weren't used to the sauce which they felt wasn't robust enough. We all liked the char siew and wantans. After Ah See Kee, we walked to Batu Pahat's "Glutton Street". Despite the name, it's actually a minor road with several stalls lining the street sides. We went to look for the no signboard fish ball noodles stall which comes highly recommended by Johor Kaki readers from Batu Pahat. 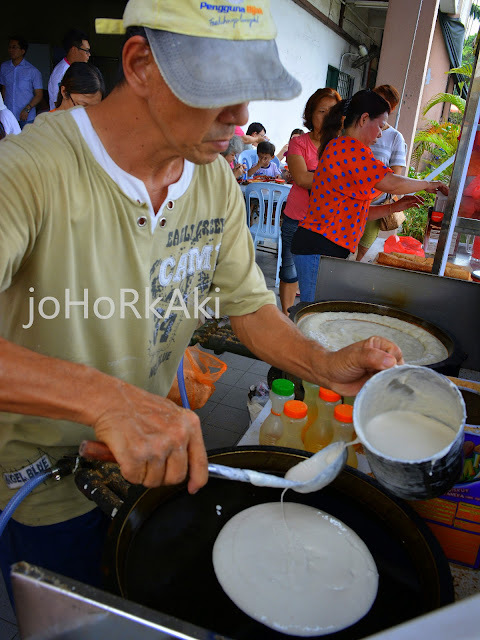 I always missed this stall during all my previous visits to Batu Pahat. Bingo! Today, the no signboard fish ball noodle stall is open! 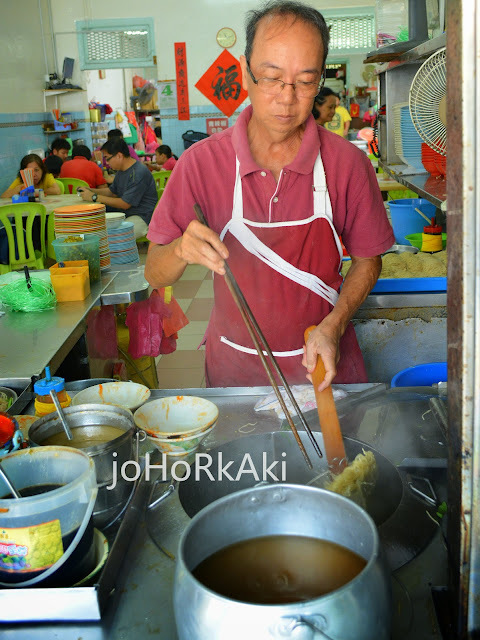 Mr Lee and his wife have been tending this fish ball noodle stall for over 40 years. 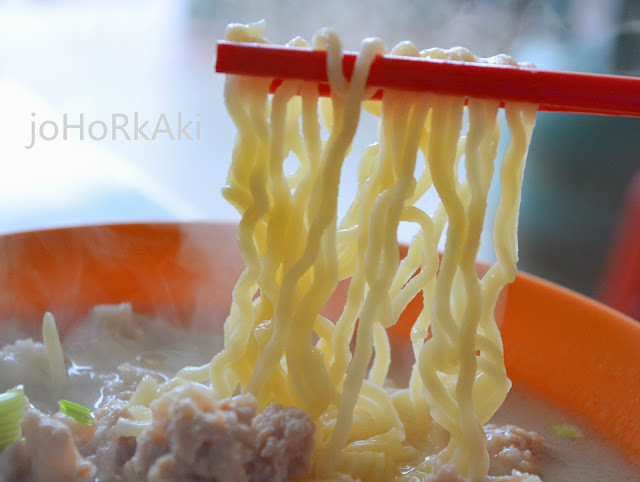 Everyone of us loved this fish ball noodles. The homemade noodles were crunchy with nice bite. The savoury spicy sauce had a pleasant hot sting. 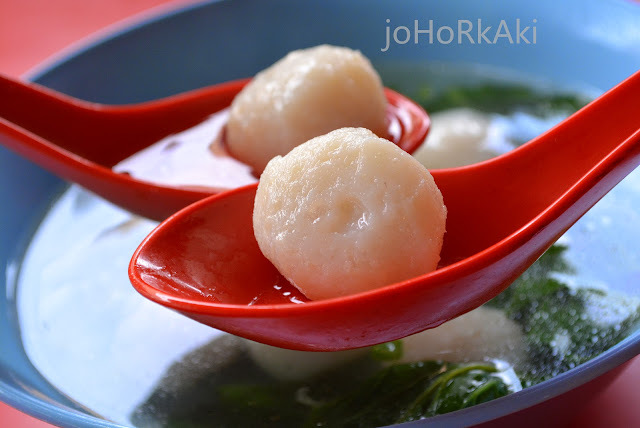 Excellent hand made fish balls made with 100% fresh fish meat. After the fish ball noodles, we proceeded to Swee Kee herbal soup 水记炖品 for their curry fish head which is highly recommended by Batu Pahat readers. Swee Kee's curry fish head was excellent. 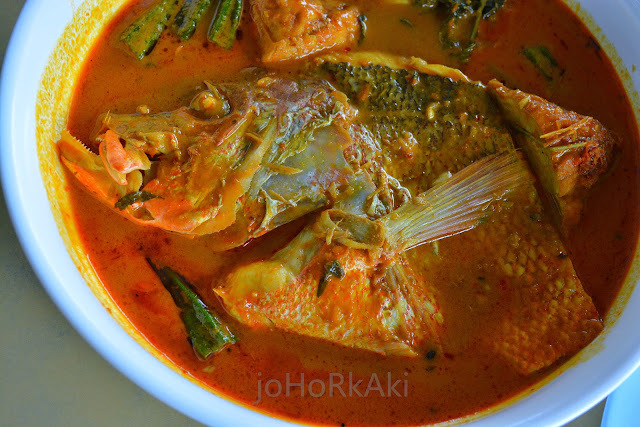 The Ikan Merah fish was fresh and the curry was mildly spicy hot, and had nice curry spices aroma and flavours. However, this was very similar to the best curry fish heads in Singapore and Johor Bahru, so it may not have the novelty appeal for tourists or food thrill seekers. Swee Kee's signature is their turtle soup but none of my companions shared my enthusiasm for this exotic dish. 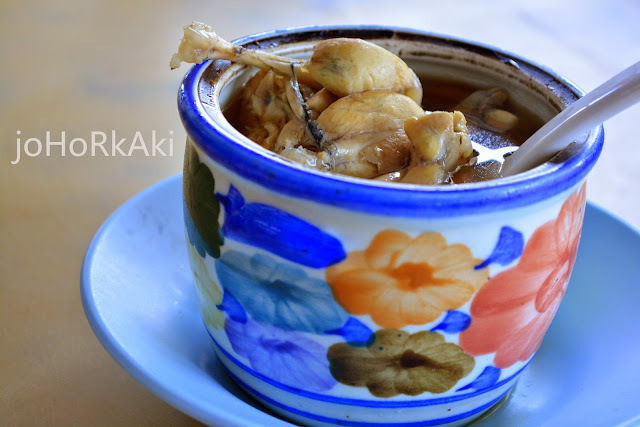 So we settled for Swee Kee's herbal frog soup. 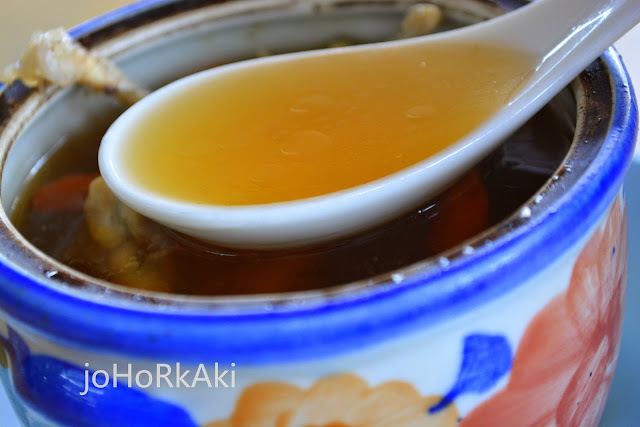 Nice herbal broth with distinct tang kuei herbal aroma and flavours. The frog meat wasn't tasty though. The meat was fibrous and all the flavours and goodness were drained into the herbal broth (as it should be). Amazingly fresh locally grown leafy greens, perfectly executed. Ah.... the simple pleasures of small town life. If you have a habit of shopping for food gifts to bring home, you can get some traditional Chinese pastries from GN 满发 just steps away, across the road from Swee Kee. Next, we stumbled upon Ah Soon fish head bee hoon and pork organ soup 亚顺鱼汤. The shop was packed with people and so we had no choice but to check it out :P I was drawn in like a bee to honey. 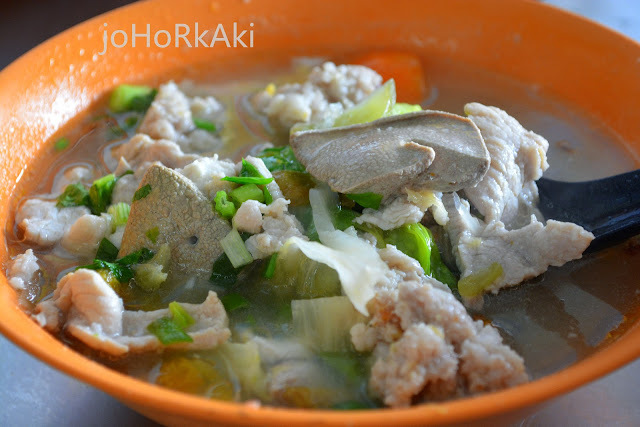 It was a very generous RM4 bowl of mixed fresh pork slices, minced meat, liver, and fish slices in a savoury, medium bodied, cloudy, steaming hot broth. The broth was savoury, sweet and had distinct tangy notes from plums in the soup. It was also slightly oily. Seeing many locals have this noodles on their tables, we ordered a bowl to try. The slurpy noodles were slightly springy and quite enjoyable. Overall, an excellent, delicious lunch but I was a little too full by now and felt bloated with all the greasy broth and ingredients. The crowds kept streaming in as we waited, ate and as we were leaving. Ah Soon 亚顺鱼汤 is obviously a local favourite. After Ah Soon, we took a walk to the end of Jalan Temenggong to another local favourite "Ta Bei Shui" kopitiam or 大杯水. At first, I wasn't too excited about 大杯水 as the name reminded me of those Taiwanese style saccharine bubble tea places. 大杯水 turned out to be an old school corner kopitiam with a popular zhi char stall and a braised duck stall. But, we were too full and just wanted a cold drink to chill out and cool our heels. Also, to give our tummies a break. When the drinks came, we understood why this place is called 大杯水. These huge mugs of real fruit juice cost RM7 (SGD2.80) each. We stumbled upon Mr Chai's ban chang kueh 曼煎糕 stall. 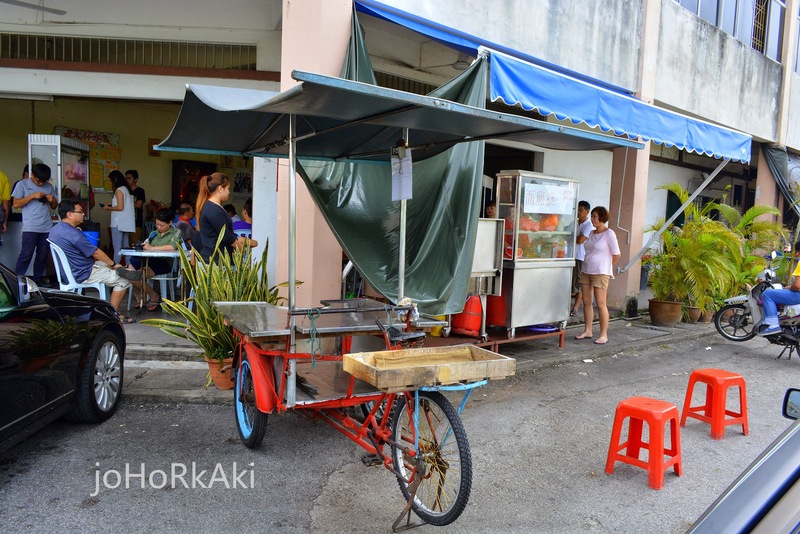 Mr Chai recently moved his mobile tricycle stall here and settled at Ta Bei Shui 大杯水 kopitiam. Mr Chai's old workhorse is taking a well deserved rest outside his new stall now. All of us were wowed by Mr Chai's ban chang kueh and agreed that this was the among the very best that we have ever tasted. Actually, there is none remotely like this in Johor Bahru or Singapore. The crust was crispy yet still had a slight gummy, doughy chew inside. 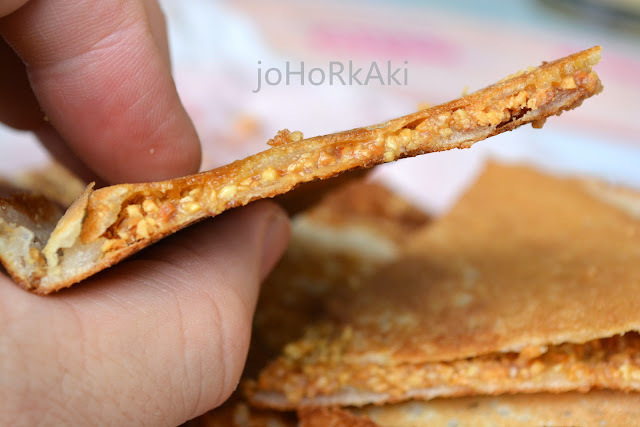 The crushed peanut, sugar and margarine were fused into a caramel, candy like filling between the crispy doughy crusts. Savoury sweet with nice mouth feel. Definitely a must try in Batu Pahat. Spotted these youths sharing, enjoying and bonding over ban chang kueh. Each marvelously delicious tray costs RM5 (SGD2.00) which we felt was very reasonable. 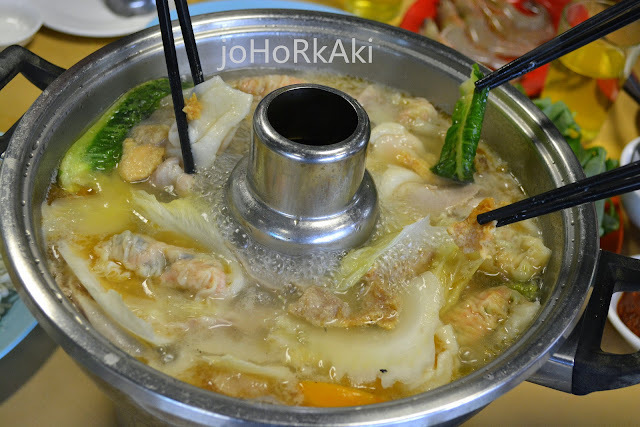 Our last food stop in Batu Pahat was Yong's Steamboat known locally as 海口泳池火锅 because it is just beside a public swimming pool. We all loved this steamboat joint. The broth was round bodied yet clean tasting. The ingredients were all fresh (we didn't pick any generic factory stuff). 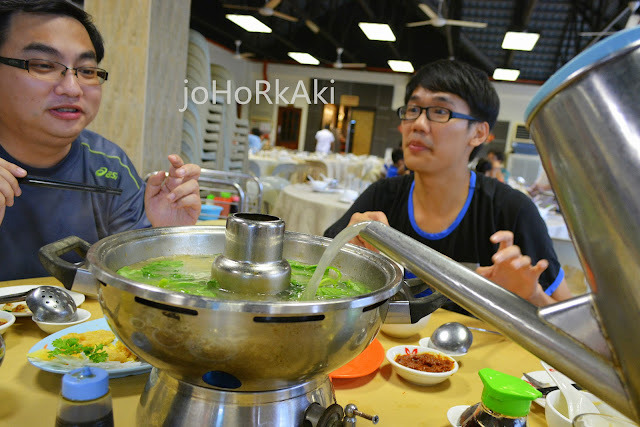 At the end of our sumptuous and scrumptious steamboat feast, none of us felt any MSG thirst at all. The broth was topped up regularly at no additional charge. The total bill for the steamboat and side dishes came to RM81 nett, which we all thought was very reasonable for the quality and amount of food we ate. 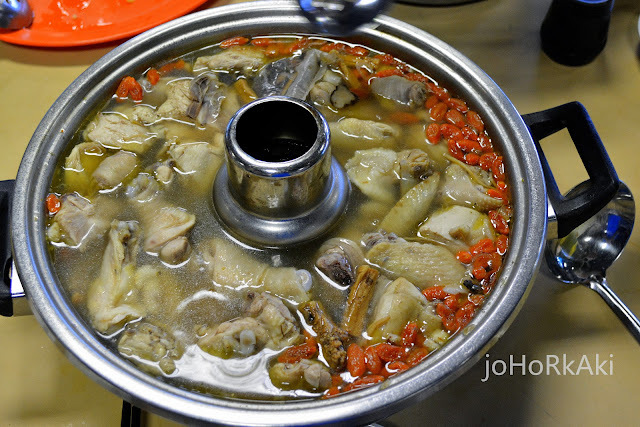 The chunks of chicken were cooked in fiery flaming white rice wine. 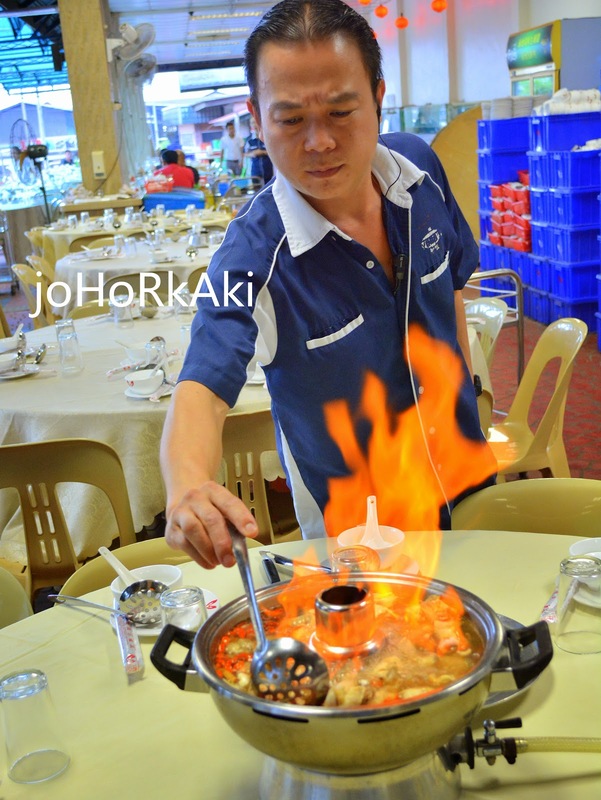 After the fire extinguished, the chicken chunks were allowed to simmer in boiling herbal broth for another 15 minutes. This video was taken towards the end of the cooking with white rice wine. The chicken was fresh and had a nice alcohol and herbal flavour. The meat was quite stiff from the boiling. The herbal broth was delicious and highly drinkable with pleasant slight alcoholic notes. A group picture before heading back to Johor Bahru. We enjoyed our short outing so much that we were already plotting our next food trail while we were driving back to Johor Bahru/ Singapore. 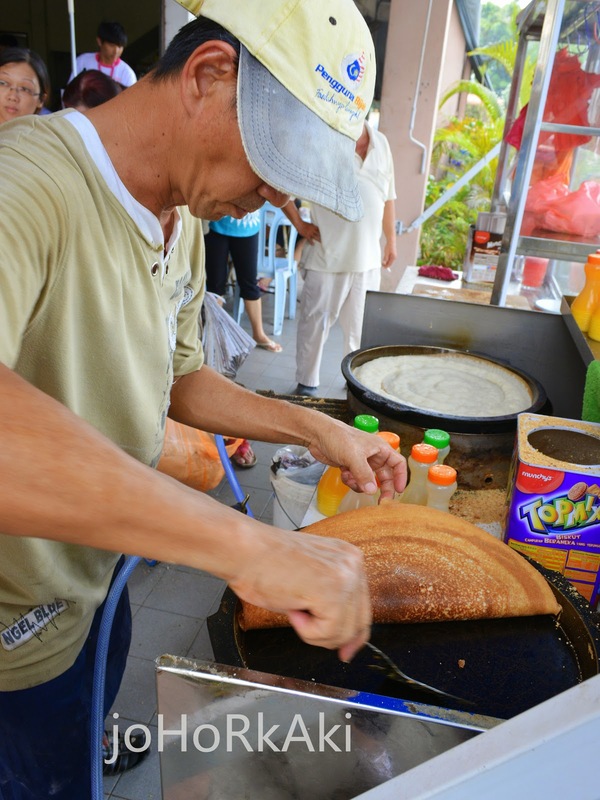 Batu Pahat have so much more to offer foodies. We shall be back, definitely. Here is Semi's blog post on the trip. I choose MST Transport because it is an ethical business providing reliable service with responsible, safety minded drivers. 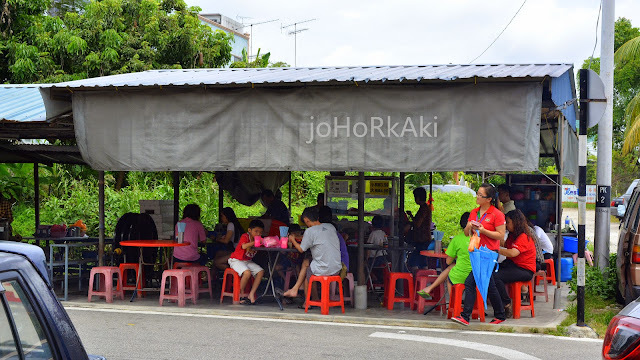 Restaurant name: No signboard fish ball noodle stall at Batu Pahat's "Glutton Street"
We left Johor Bahru at around 9:00am and arrived back in JB at around 9:00pm. Not true. He has had always been a supervisor since day 1. Apparently unscrupulous people had been spreading rumours to discredit the business. The boss has been the same one since the start of the business. I do agree that Batu Pahat has a lot of gastronomic delights, you can never finish all the food we have to offer in a day. A point to note, the Ah See Kee wanton noodles, the original lady who mix the trademark sauce has now opened another shop in BP Garden. The quality of the noodles is the same only difference is the sauce has more oomph than those found in the original shop which in my opinion has become too over rated. The Da Bei Shui and Ban Chang Kueh owners are brothers. One being the eldest and the latter the younger. Your Da Bei Shui location seems to be wrong. Next time can come try the signature dish of Pao Guan Herbal Soup 's "pepper root of wild board knuckle" and "crispy pipa duck"...marvellous~~!the shop is just at aeon big area~·behind Mcdonald. Interesting! Shall add them to my list for next visit. May i know where is the ban jian kueh stall located? Thx. 地址 " 70 jalan tempines taman makmur,83000 Batu pahat, johor." Thank you for your recommendation. 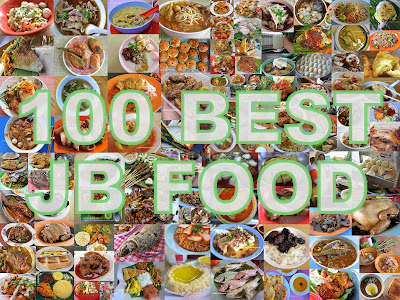 I will surely look for this stall at our next visit. Much appreciated. Hi sir, I'm feeling deeply regret cause I'm only introducing you this now. Their signature dish is Assam fish. Spicy sour lover would be dying for it after the first try! 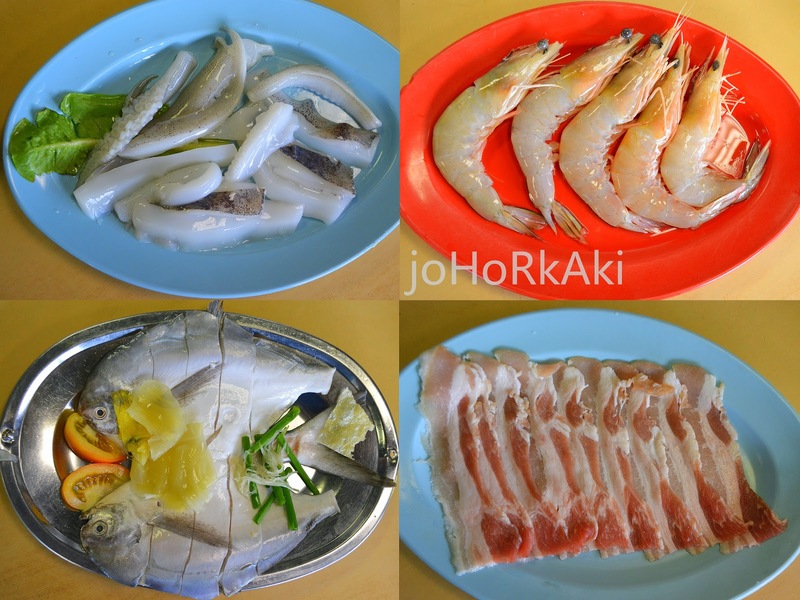 They also have 蚝煎蛋，龙舌鱼（famous as well），sambal petai sotong prawn ( their sambal is superb), and Claypot fish head and curry fish head! Worth the try seriously. Hope you would come back again alright? Thank you Stella for your suggestion. 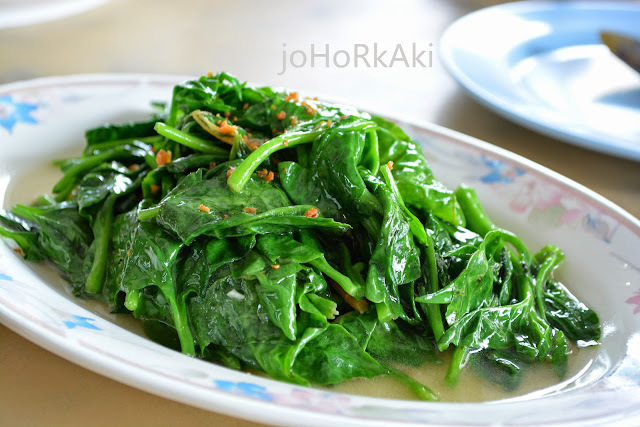 I will definitely look out for Kou Foo during our next visit. Thank you much. Wah my hometown! Bo jio! Haha, actually I know so little of what's good there. But I love the Ah Soon pig organ soup. Two other great places are Dianfa Eating House and K-10 Kway Chap! Thank you Katherine ;-D shall add these tips to the itinerary for our next trip. Unless it's 'yee mee' or kung fu chow, cooked noodles like Ah See's and the fishball are not crunchy. Don't quote me on the above though as I haven't been back to BP in a few years but these 4 is at the top of my list (apart from good old Ah See Wantan Mee) everytime I go home. Thank you IT ;-D shall add these suggestions to the itinerary for our next trip. The food is yummy! But do the water quality and food preparation process comply with the required safety standard? I come to Batu Pahat regularly, and in fact, was there today. We had another great day and never have any problems before with water quality and hygiene. That said, of course, we have to exercise the same vigilance we would anywhere in the world, including at our own home and country. sharing in delicious. And naturally, thanks in your sweat!